The New York Times described flutist Lisa Hansen as “irresistibly lyrical” and praised her “considerable coloristic variety.” She is a graduate of The Juilliard School and a winner of the New York Flute Club Competition. 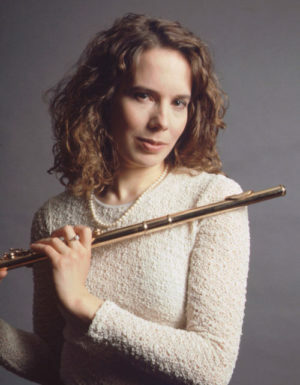 Ms. Hansen was featured in the Emmy award winning CBS documentary: “Juilliard & Beyond – A Life in Music.” Formerly principal flutist of the Mexico City Philharmonic, she won critical acclaim for her EMI-Angel recording of Rodrigo’s Concierto Pastoral with the London Royal Philharmonic Orchestra. Her recording of Carl Nielsen’s Flute Concerto for Centaur was selected by Fanfare a Best of the Year Recording. A champion of Latin American and Spanish music, Ms Hansen performs with the Grammy nominated North/South Consonance Ensemble. She has concertized extensively in the United States, Latin America and Europe. She is Flute Professor and Concert Artist at Kean University.